Here we are at the Washington, D C annual spring “Capitol Fly – In! We were part of an effort by the American Loggers Council focusing attention on the importance of logging to the forest products industry and the family – owned businesses that operate them! This year the thirty state associations around the USA made 142 contacts to their Senate and House of Representatives. Our Virginia Loggers Association team made visits to all thirteen Virginia Congressman (2 Senators and 11 House of Representatives’ members). We aimed our attention on the importance of logging to the forest products industry and the family – owned businesses that operate them. Our most important emphasis was on Virginia loggers and their challenges and opportunities. Vance & Laurie Wright and Judd & Carmen Smith spoke as business owners and land holders who actively manage their forests for many benefits. They asked our elected representatives to seek out the opinions of family – owned logging businesses before making major decisions impacting the harvesting/logging community by contacting the Virginia Loggers Association who represent their interests. 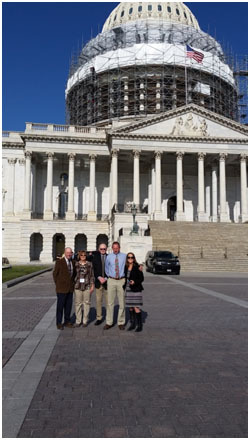 During our visits, we brought the four primary issues of the nations’ loggers gathered through the effort of the American Loggers Council to each representative. Interstate hauling weight, youth in logging, and two national forest issues were top priorities for us. We met with Legislative Assistants or Senior Policy Advisors and briefly met with three Congressmen. At each of our Virginia meetings, we made specific requests or “asks” for each of concerns. A quick summary of those requests is below. Right to Haul – we requested federal legislation be enacted to allow our industry to haul on the Interstate highways within a given state the same legal weight allowed by the state for all non-interstate highways. In Virginia, the federal change would mean allowing us to haul 90,000 pounds of forest products on Interstate highways. Note: The Virginia Loggers Association is also currently working with members of Governor McAuliffe’s administration to push forward with an alternative federal change allowing us to haul 90,000 pounds of forest products on specific sections of Interstates around heavy forest harvesting and mills. We are making preparation to pursue this change in case Congress does not fully authorize the “right to haul” universally across the nation. Youth in Logging – we requested that family children ages 16 and 17 be allowed to work in family owned logging businesses to help family owned businesses be able to engage their children at an early age in the business to accommodate business transfer to the next generation. National Forest Wildfire Suppression Fire Borrowing – the US Forest Service often borrows money from important budget line items necessary for private forest landowners’ programs and national forest management to pay for wildfire suppression costs. We requested that “fire borrowing” be discontinued and that Congress authorize access to FEMA, or some other source, to pay for wildfires when the USFS wildfire suppression was spent. National Forest Management Reform – we requested that our US Forest Service increase its management on our national forests, including more timber harvesting, to improve the health of forests, set a better example for private ownership, and reduce the chances and severity of wildfires. If you have any comments or questions about any of the issues discussed during the Virginia Loggers Association visits with our Virginia Congressional delegation, please contact Ron Jenkins at info@valoggers.org or by phone at 804 – 677 – 4290.